cooler is ultra-portable and protects your investment wherever you go. to work all day without making any noise and interrupting your flow. 1. SUPER HEAT DISSIPATION, INSTANT COOLING. 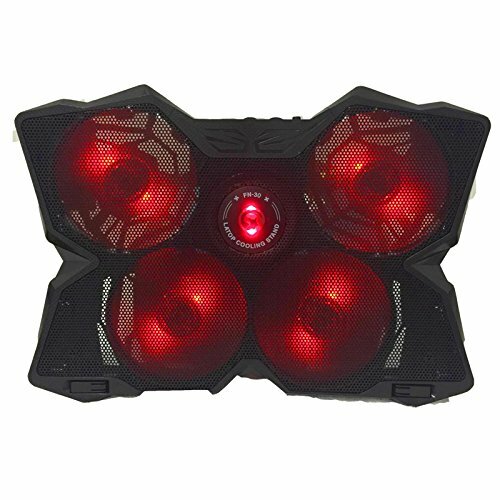 ▲　It is designed for gaming use, born for gaming this cooling pad can support Laptops up to 15"-17"; Ultra-quiet fans create a noise-free environment for you. 2. EXTRA USB DESIGN, ULTRA PORTABLE. ▲　Extra USB port and power switch design. Built-in dual-USB hub allows for connecting more USB devices. Slim and portable, weight only 1.61 pounds. 3. FOUR NUCLEAR EFFICENT FANS WITH CONTROLLER. ▲　This pad has 4 high performance 140 mm fans can spin at 1200 RPM/one, 4 fans can work coinstantaneously or separately, you can adjust the speed of the fans as you like. 4. ERGONOMIC COMFORT.▲　Doubles as an ergonomic stand with two adjustable height settings. 5. INCOMPARABLE UNIQUE COOL DESIGN GAME BLOOD. ▲　Miraculous cool and magic design can catch people's eye, make you outstanding. If you have any questions about this product by MARVO, contact us by completing and submitting the form below. If you are looking for a specif part number, please include it with your message.